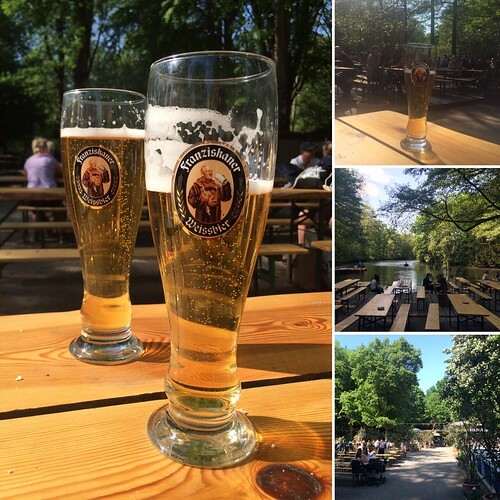 When the weather’s fine enough to eat outdoors, Café am Neuen See restaurant and biergarten in Berlin’s beautiful Grosser Tiergarten is the place to be. In a tranquil lakeside location, the beer garden stays open until sunset, serving beer – on tap and bottled – along with tasty Bavarian and Italian specialities like freshly made pretzels, weisswurst (white sausage) and leberkäse (meat-loaf), sourdough bread and stone baked pizza. Admiring the lake-side view and listening to the tweeting birds while sipping a cold weiss beer is a mighty fine way to spend a leisurely afternoon. The Café am Neuen See restaurant serves breakfast, and coffee and tea and cake throughout the day, as well as more extensive food options if you prefer something more substantial. 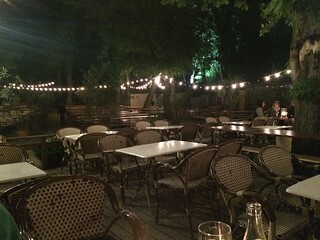 But it really comes to life after dusk, once the biergarten closes and the restaurant’s outdoor area is lit up with fairy lights and candles. 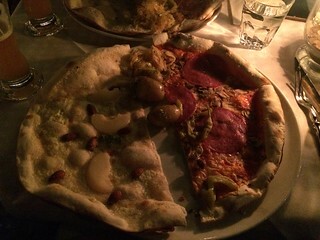 K and I order wheat beers and two flammkuchen (Alsatian baked flatbread) to share – one with pepperoni sausage and mushroom (this one has a tomato base, like a stone baked pizza) and one with gorgonzola, pear and almonds (no tomato sauce base) which is just stunning and delicious. 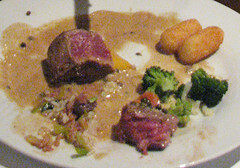 The verdict: Gorgeous food in a gorgeous setting. What more could you ask for? 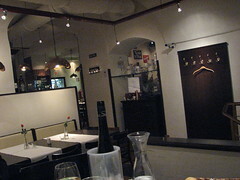 The Altstadtbräu on Naglergasse is another spacious, cavernous pub/ restaurant/ club, and serves really classy, quality food. When we ordered, our very helpful and professional waiter suggested we try alternative (better) items from both the food and drinks menu, and talked us through the local specialities. 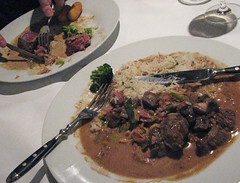 I followed his advice and had an Austrian speciality of mixed meats in a rich gravy with rice, K had a prime beef steak with croquettes, washed down with Austria’s own grüner veltliner wine. Top recommendations. Mariahilferbrau is an open, spacious bar and restaurant on Vienna’s miles-long Mariahilferstrasse, which seems to stretch end to end across the city. Mariahilferbrau serves a great range of German and Austrian ales (including weiss, darks and golds, etc), wines (including Austria’s gorgeous, dry, Grüner Veltliner) and food (including Viennese würstel with goulash, freshly baked pretzels, schnitzels, etc). 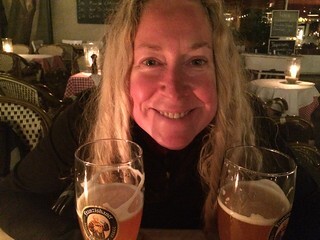 We were fortunate enough to be staying at a hotel a couple of doors down from Mariahilferbrau last weekend. And, as our early flight (that we caught with seconds to spare… but that’s another story) got us into Vienna by 10am, we had a couple of hours to relax before we could check-in to our hotel. This was our first trip to Vienna and quickly realised that everything about it is big – vast open spaces, wide boulevard streets, spacious restaurants and bars. Even the food portions are enormous! We chose ‘wurstel mit saft’ and ‘brot schinken & kase’ along with a freshly baked pretzel from the ‘light snacks’ menu, intending to have a light lunch. They all turned out to be huge and the scorching hot, straight-from-the-oven pretzel was a real treat. Service here was incredibly helpful and friendly – the girl serving us had a great sense of humour and was really good fun. Inevitably, this became our local during our brief stay.